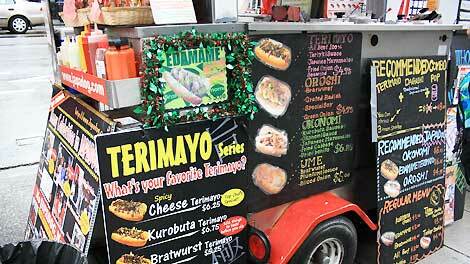 The NewsLine: Gourmet hot dogs? Looking back on a year in food-related news dominated by KFC's headline-grabbing Double Down sandwich, you could be forgiven for thinking that gluttony will continue to be a trend, but in this survey of the industry's top prognosticators, it's clear there is a wide variety of new flavours and techniques headed for our plates in 2011. Besides the limited-edition Double Down, which KFC Canada touted as its most successful menu item ever, a survey of dining trends across North America leaves little doubt that food trucks came of age this year. The 2011 San Francisco edition of the influential Zagat guide, for instance, gave full reviews and ratings for the city's mobile food purveyors. The trend appeals to people who want to eat well, but would rather skip the hassle of making reservations in advance, the formality of a sit-down dining experience, or the typically high restaurant prices. 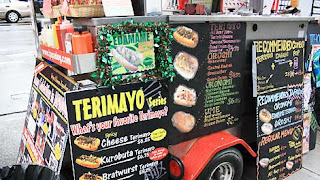 Toronto's bucking the trend, however, as the city's bureaucracy-approved attempt at street food has sputtered since its introduction under the "a la cart" banner in 2009. Unfortunately, the project's name seems to have been the smartest thing about it, as the few vendors who met all requirements -- including the purchase of a one-size fits all, city-designed food cart -- have struggled to stay afloat. Not so in Vancouver, where a pilot project was approved this summer that saw the introduction of a host of new vendors to compete with the city's already successful Japa Dog and Tandoori Tikka Dog. Since then, West Coast food-lovers have embraced the scene in all its flavours -- in a dizzying variety that spans pulled pork to dim sum, Japanese crepes and Chinese-style skewers. If the trend-watchers are to be believed, a growing appetite for more adventurous food experiences is going to continue to take hold nationwide. People are looking for adventurous food -- the PanDa truck's mac and cheese-stuffed croissants are nothing if not a trip into the culinary unknown. Woe, Toronto where the wiener has many whining that they're still effectively without choice when it comes to street food. Perhaps they can find solace in the prediction that the haute-hot dog will grab a bigger bite of the fast food market in the coming year. In his fourth annual list of trends, San Francisco-based restaurant and hotel marketing consultant Andrew Freeman, of Andrew Freeman & Co., expects chefs to turn their attention to the diminutive sausage in a bun. Taking cues, perhaps, from such purveyors as Ontario's Buddha dog, with its focus on quality and provenance, or the Asian-infused toppings made famous by Vancouver's Japa Dog. But Freeman's top prediction for the coming year calls on the humble pie -- in all its varieties from sweet to savory -- to take the place of cupcakes as the next pastry de jour. "If I had one trend -- one trend -- of the year that I could predict, that's why it's in the No. 1 position, this would be the trend for pie," he told reporters in a recent online seminar. "I think that we're going to make room for pie shops in the next year." The U.S. industry website Nation's Restaurant News agrees, predicting pies will be a menu-topping restaurant trend in 2011. But don't just look for the crusty favourites you're used to -- think deep-fried pies, pie-flavoured everything from shakes to ice creams and even bite-size pies. That mini-form factor will continue to pervade all food categories, Freeman predicts, as traditional meal portions give way to snack sizes. Appealing to cost and calorie-conscious eaters looking for stuff to eat on-the-go, expect to be reminded that small is definitely big. On a similar theme, Freeman also notes the rise of mom-and-pop shops that are owned, designed, operated and self-financed by people seizing the real-estate opportunities created by the still-struggling economy. Toronto Chef Scott Vivian, who opened the restaurant Beast with his wife this summer, definitely sees the connection. "I think it ties into the whole fine-dining-not-coming-back-for-a-while thing," Vivian told CTV.ca, reflecting on his observations of the restaurant scene. "The majority of places opening now are small, neighbourhood mom-and-pop type places, and they're all doing comfort food -- including ours." But that doesn't mean diners will only be treated to variations on their mother's home cooking, Freeman says, as chefs continue to tinker with some new flavours and techniques. Experimental variations of popsicles and soft-serve ice creams, for example, as well as chefs' own versions of familiar junk food like cheesies and jerky will pop up on restaurant menus. Chefs will also abandon sauces, Freeman predicts, in favour of the crumbled, dried and powdered garnishes popularized by chef Rene Redzepi at Noma in Copenhagen. Redzepi -- the 33-year-old chef of the restaurant ranked first on the influential 2010 S.Pellegrino World's 50 Best Restaurants list -- is famous for using such garnishes, unappealingly dubbed "dirt," throughout his award-winning menu. But chef Vivian thinks what's going on at Noma is far removed from most people's everyday experience, and he expects it to stay that way. "Noma's still on the same level as Fat Duck and elBulli," Vivian said, noting two other top-ranked restaurants known for highly experimental menus created by massive teams of chefs. "Noma is just doing it in a more terroir-based, rustic way, but they're still using techniques that a lot of people don't even know about." Even though such cutting-edge techniques may never see the light of her kitchen, food activist, writer and chef Joshna Maharaj draws a lot of inspiration from Redzepi, and she foresees chefs across Canada to start paying more attention to what's happening in Scandinavia. "I was really inspired by him," Maharaj told CTV.ca, recalling her chance to hear the Danish chef speak in Toronto this summer. "What I thought was such a great lesson from him is that our climates are similar and he's doing beautiful local things with that very limited climate. "I think we have a bit of a self-esteem issue here because our growing season is so narrow -- we think that there are not a lot of local things that can be produced -- but his restaurant is a great example of what can be done. It just takes a little imagination and creativity." "Meatless Mondays" will continue to make inroads, heralding the mainstreaming of the vegetarian diet -- at least some of the time. The public taste for yogurt will continue to grow too, including an embrace of cultural variations like Icelandic skyr and Lebanese labne. The inclusion of more goat and lamb on restaurant menus, as chefs weigh the price with the growing adventurousness of their diners. A proliferation of one-item restaurants focused on gourmet burgers, grilled cheese sandwiches, "big biscuits" or even peanut butter. Hot ingredients the trend-watcher expects chefs to be making room for in their pantry next year include whey for salads and sauces, kumquats in relishes and desserts, hummus in sauces and spreads, popcorn, pretzels and locally-sourced honey. Smoking will be hot too, Freeman says, for imparting new flavours into oils, spices and even butter. When it comes to what you'll find on grocery store shelves next year, trends analyst Richard Cope of the Chigago-based market research firm Mintel expects shifting demographics to continue to influence the way marketers position their foods. Energy drinks, for example, will no longer be the exclusive domain of the youth market as older consumers get the message that such drinks, foods and snacks can help get them through their day too. The same goes for packaging and positioning of a host of other supermarket staples, as more men take on the shopping duties. If you've noticed the growing choice in cosmetics for manly men -- Dove Men + Care, for example -- expect the same sort of masculine messages to start pervading the freezer section. But overall, Mintel doesn't expect any major changes, just the continuation of several ongoing big-picture trends -- like our ever-growing waistlines. As obesity grows, food makers and their marketers have to decide whether to cater to it with foods that emphasize indulgence or health. Brands that can figure out how to combine both -- think of the growing choice in the 100-calorie indulgence category now occupied by all manner of junk food -- Cope predicts will overcome that challenge best. The continuing, quiet reduction of sodium and sugar in many product formulations, as well as the growing backlash against high-fructose corn syrup that could see it wind up as the next ingredient pariah along the lines of trans-fats. The creeping professionalization of the amateur, as consumers look for products that enable them to bring the restaurant experience home in gadgets to better cook with, or chef-endorsed packaged foods. The new retro, with more big brands harkening back to a more nostalgic era by resurrecting old products, recipes, packaging or ad campaigns. Redefining the term "natural," as confusion around the increasingly ubiquitous term points inevitably towards some form of regulatory intervention. The co-owner of the Healthy Butcher shops in Toronto says that last prediction couldn't come true too soon. "The unfortunate thing is when you go to places selling 'natural' they'll say this is just as good as organic but it's just not certified," Fiorucci told CTV.ca, suggesting that consumers who buy their products from small shops are more likely to get a straight answer. "When you go to a grocery store you can't ask the package questions," he said, explaining that he and his wife were previously vegetarian, simply because they couldn't be certain of what they were buying at the meat counter. That's why they started their own butchery business. "If you can't ask a question and get an answer you're satisfied with, I don't think you should be buying it," at least when it comes to meat, fish and fresh products, he said. Acknowledging his own self-interest as a small-business owner, Fiorucci is an unabashed supporter of buying local products that can be traced back to the farm they were grown on. Rather than a trend, the former Bay Street lawyer-turned butcher says it's a movement that shows no sign of abating. Based on its first-ever survey of food trends this year, the Canadian Restaurant and Foodservices Association tends to agree. Looking at what's on restaurant menus across the country, the CRFA put locally-sourced food at the top of its list, followed closely by sustainability and organic, as menus focus on offering simple back-to-basics type foods. "You could do a lasagna and put beef tongue in it and customers will probably try it," Vivian said, explaining how chefs are combining the appeal of familiar foods with the lure of a taste adventure. "The lasagna is comforting and with the beef tongue they can say I've never had this type of lasagna before." Peering deeper into its own crystal ball, the CRFA expects to see more African and Middle Eastern influences, as well as even more creations tailored to gluten-free diets. Ancient grains, non-traditional fish and novel cuts of meat may also take a slice out of the market. "If farmers are able to get more value out of their tertiary cuts, then they can potentially spend more money on raising the animal and as a result raise a better product," Fiorucci said, adding that he is already serving a growing number of customers looking for alternatives to conventional meat. Grass-fed beef, for example, is really taking hold. "It's leaner, higher in Omega 3 and essential fatty acids so there's that health aspect to it," he said, compared to the conventional practice of feeding cows with corn or grain. Willingness to embrace the more flavour-forward grass-fed beef may be an example of what Maharaj calls a "spirit of gutsiness" that is seizing food lovers of all stripes. "This time in our food history is about not being afraid to use bold, serious flavour," she said. According to the travelling International Food and Beverage Exhibition SIAL 2010, new tastes, textures and "it" ingredients for 2011 focus on exactly the kind of bold taste experience found in fruit and spice combinations, for example, as well as chili chocolate, wasabi and ginger. Expect to encounter more froth, crisps and crunches too, as multiple textures take hold. Superfruits will continue their march into the mainstream as more consumers demand the benefits and enjoy the flavours of acai berry,acerola, cranberry, wolfberry, guarana, noni, yumberry, blueberry, guava, morello cherry and Canada's own Saskatoon berry. Looking ahead, Maharaj expects chefs to do some wild things in the coming months. "There's a boldness about chefs not being afraid to say what they want to say, do what they want to do and let people decide if they're into it or not," she said, suggesting home cooks not be afraid to go down the same path. "There's an incredible satisfaction in being able to cook something lovely for yourself, or bake something for someone, or make an edible gift. It's not hard and it's not expensive." Besides, she believes it's the perfect way to get in on another of the hottest trends right now: artisan-produced foods. After all, what better artisan than you? "There's a huge move towards the notion of appreciating things made with somebody's hands," she said. "We want that because we want better quality, we want to know the ingredients, and I think we're also craving the beauty and the art and, dare I say love, in all of that."